This is a living theological text that invites personal experiences into the exploration of divinity. 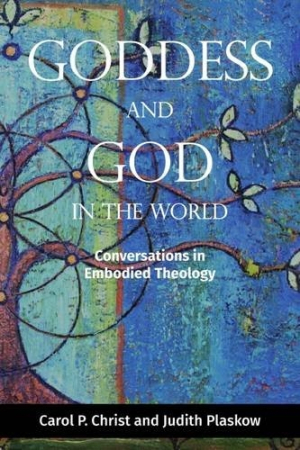 From pioneering feminist theologians Carol Christ and Judith Plaskow comes a vibrant new work of embodied theology, Goddess and God in the World. Its theological presentations are both conversational and experiential, inviting seekers into an illuminatingly human exploration of divinity. Above all else, Goddess and God in the World is a living theological text—a work that pries into the scholars’ previous publications, that invites new understandings on topics from ontology to theodicy, and that meticulously self-examines its own varied conclusions. The final product is both brilliant and nonforceful. It invites dispute; it is empathetic and persuasive; and it always insists upon the significance of individual experiences. Those already familiar with Plaskow and Christ’s discipline-rocking publications will be thrilled by the work’s biographical chapters, which locate moments of rebirth and renewal in their individual journeys. Both Standing Again at Sinai and Diving Deep and Surfacing are given critical context, with their authors moving beyond those texts to delve into matters not originally explored, particularly around their evolving understandings of deity, and how those notions affected their interactions with religious institutions, the academy, and the greater world. Such contextualizations are certain to delight those familiar with the scholars. But so too will Goddess and God prove to be a critical text for all of those who wish to understand how the teachings of patriarchal religions—and the academies that educate leaders in them—impact those at the margins of their systems. Its unique composition and disciplinary insights will render it a central text in feminist theological canons. Its chapters posit truths that traditional theological approaches are reticent to acknowledge, most loomingly that theologies cannot be divorced from concrete human experiences, particularly if they are to be a positive force. Goddess and God in the World breaks new ground when it comes to understanding not just how human beings think of divinity, particularly beyond purely philosophical conceptions, but of why such personal understandings matter. Its assertion-and-response methods and often intimate prose make it a text that begs for human interaction and stands to impact justice-minded readers from all spiritual walks.